Bbc Refuse To Colour Uk Red? On BBC "Eurozone in Crisis" interactive map (found at http://news.bbc.co.uk/1/hi/business/10150007.stm ) it is interesting to see that the BBC couldn't bring themselves to colour code the UK red along with other damaged countries and instead has left it neutral grey. An example is attached, showing relative deficits. 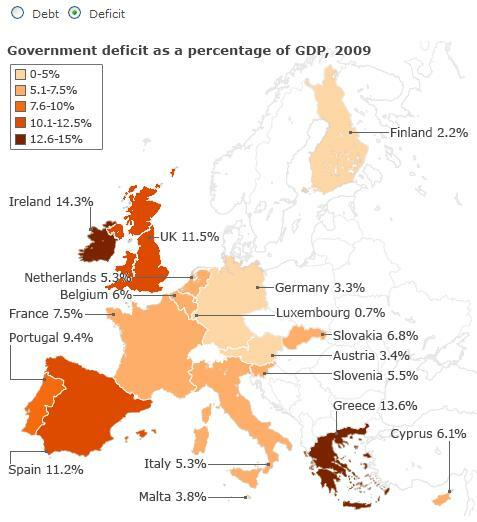 The UK should be colour coded RED, 3rd behind Ireland and Greece, but they have not colour coded it. 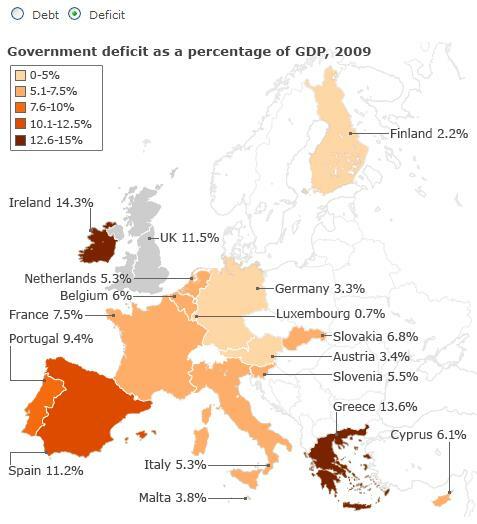 Are the masses so easily protected from the UK's fiscal reality? I noticed this immediately when I viewed it previously. It straight away gives the impression that the UK is better off than everywhere else. Though, we know better don't we? I understand that we are not in the Euro, and hence might actually deserve to be completely ghosted out of the graphic all-together, like Norway, Sweden, etc. But the fact is they they have included us in the comparison, without actually including us in the colour-coding. To anyone who can't count it gives the visual impression that we are better off than all of the countries that have been coloured-in, whereas in fact we are in a far worse state than most. Tell you what i didnt realise, was that finland was using Euros, I was there only about a year ago, and I dont think that they were using Euros then... but i might be wrong, im in a different country everyday so get easily confused!!!! ... but i might be wrong, im in a different country everyday so get easily confused!!!! The trick is to look down at your feet. If the soil is a pale orange colour then you are in Italy or France, dark orange and you are probably in Spain, and if it's grey then you are in the UK. (If it's transparent and made of a glass-like substance then chances are you are in Norway or Sweden). If the UK were in the eurozone, it would also fall foul of the criteria, with its debt now standing at 68.1% of GDP and its deficit at 11.5% of GDP. So apparently we are a chicken not a piig. edit: it's the only Scand. country that does though. But what will it look like after the £6bn cuts? 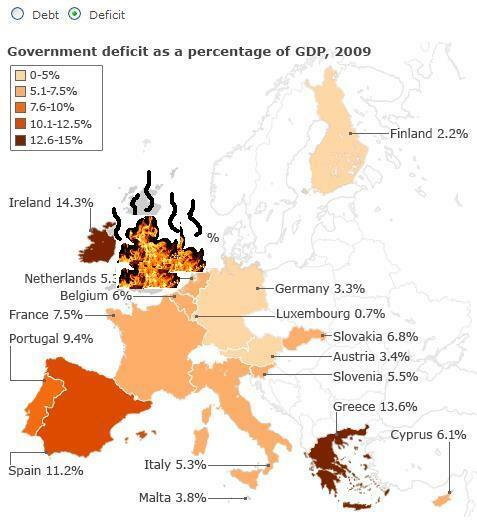 Ireland looks very red, like the blood of a million public sector workers. About Me:Neutral on houses. Bear on Bonds. Neutral on equities. Neutral on gold. Bullish on bitcoin. Bullish on improving the veg patch.